Artist Kat Clancy: It was truly a description of spring in Moscow and the verbal images were very recognizable. I know the “Goth boy in is black greatcoat.” And we hear the bells of the bell tower every day. Poet Robert Wrigley: The Jesus over Rio seemed a good possibility, as it was for Stacy. Ditto dandelions, which Kat worked in. I confess to being fairly awestruck by the work of visual artists, especially in response to poems, and what these two artists produced pleases and delights me. The way one brings in the great menacing clouds, the other the rain—well, every time I look at either broadside, I just sit and grin like an idiot. Artist Kat Clancy: I really started out not knowing where I was going, but liked the image of the dandelions being pummeled by the rain and wanted to capture the moment just before that happened. Did either visual artist refract any element of the poem that made you see the poem differently? Poet Robert Wrigley: Kat looks, and makes me see, minutely, I think; Stacy looks large; this strikes me as a wonderful way of seeing the poem from two contrasting and yet entirely complimentary ways. The poem means to offer both possible perspectives, and the fact that the artists have registered these two perspectives opens the poem wide. That’s a lovely thing to encounter, both from my point-of-view and, I believe, from the point of view of the reader-looker. What caught your eye in the visual response by your fellow Broadsided artist? Artist Kat Clancy: I am drawn to the patterns in her work. There are patterns of color, patterns of texture and small and large patterns. Does anything surprising rise to the surface when you consider the two pieces of art and your poem together? Poet Robert Wrigley: Well, any sort of other artistic response to the poem surprises me, in the sense that surprise is a necessary component of all of art. We “see” poems, of course, as constructs on the page, and to this extent, most poems look alike; they look “like poems.” But of course the imagery of the poem, rendered as language, means to bring forth visual (and musical, as well as all other manner of sensory) details. The surprise for me is simply that the artist necessarily focuses on particular imagery, and by such a focus—and this is what strikes me as the sweet miracle of this sort of collaboration—the artist actually enlarges the poem’s saying. What is it like to see both visual responses to the poem? Artist Kat Clancy: I love that our responses were so different, but still captured the poem. Have you ever written work that has been inspired by visual art? Poet Robert Wrigley: A few. Most successfully, I think, a poem that responds to and builds a narrative from Thomas Hart Benton’s great (and immense) “Persephone.” There have been a few others as well, but I think I often tend to avoid visual art as the subject of, or the trigger for, poems. Why? Probably because I believe poetry’s very medium—language—is suspect. Sullied, even. We write poems in the same language with which we woo and wound; it’s the same language used in the world of political and capitalistic mendacity. Not so, or not so much so, with the visual arts or, say, music. No one need translate a painting or a sculpture, so there’s something essentially purer in the other arts. I remember a story of someone in a gallery, looking at a photograph, by Yusef Karsh, of the hands of the great pianist Vladimir Horowitz. Another patron said something like, “Beautiful, isn’t it?” and the first viewer said, “Shhh, I’m listening to the music.” Visual art can do that; so can poetry. A poem written in response to a visual work has to accommodate not only what is visual, but all the other sensory impressions rendered therein. And then it has to do more; it has to do what IT has in mind. What I’m saying is, it’s very, very difficult, so I do it now and then, but not often. 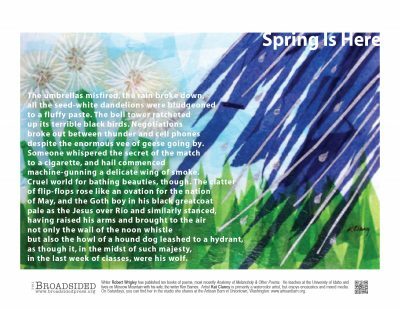 If you had to represent your Broadsided collaboration of “Spring Is Here” with one word, what would it be? Poet Robert Wrigley: Transcendance, again. Only from, one might say, the perspective of the earth and its humblest flowers. Those dandelions. If you had to represent Stacy Isenbarger’s version of the collaboration with one word, what would it be? Poet Robert Wrigley: Transcendence. That’s what’s (hopefully) in this poem. The grandness of the moment, the “as though” made real. That goth boy become, for an instant, the great icon. Artist Kat Clancy: I just finished Sacre Bleu by Christopher Moore and Lean In by Sheryl Sandberg. Poet Robert Wrigley: Simon Armitage’s The Shout: Selected Poems; Mary Ruefle’s Madness, Rack, and Honey, a collection of lectures/essays on poetry. Artist Kat Clancy: In April I got to visit the Phillips Collection in Washington DC and see the beeswax room as well as some wonderful art. Poet Robert Wrigley: I was in Portland, Oregon, yesterday, and I took a walk through the Portland Farmer’s Market, and there was an artist who had made large and elaborate blossoms from cast-off plastic water bottles. They were spectacular, and they also made, of course, a comment on the whole idea of cast-offedness, the plague of plastic that afflicts us. Artist Kat Clancy: I just want to say thank you to Robert and Stacy, the City of Moscow and Broadsided Press for allowing me to be part of such a unique and wonderful collaboration. Poet Robert Wrigley: Only that I am honored to have seen such wonderful work done in response to something I’ve written. For which I offer my very sincere thanks to Stacy and Kat, and to Broadsided Press. NOTE: This month’s collaborations ALSO went live on the busses of Moscow, Idaho—along with others from our archives. Poet Robert Wrigley has published ten books of poems, most recently The Church of Omnivorous Light: Selected Poems and Anatomy of Melancholy & Other Poems. He teaches at the University of Idaho and lives on Moscow Mountain with his wife, the writer Kim Barnes. Artist Kat Clancy is primarily a watercolor artist, but enjoys branching out to encaustics and mixed media. On Saturdays you can usually find her in the studio she shares at the Artisan Barn in Uniontown, WA. You can find examples of her work on the Barn’s website.